The Entrepreneurial State (2014) sheds light on the state’s role as a daring investor in emerging technology. From the iPhone to sustainable energy, these blinks reveal the central role governments have played in creating the world we know today, and how they can help to secure our planet’s future. Mariana Mazzucato is a renowned professor of Economics of Innovation who teaches at the University of Sussex. 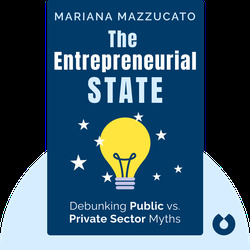 The Entrepreneurial State was the Financial Times and Huffington Post Book of the Year.